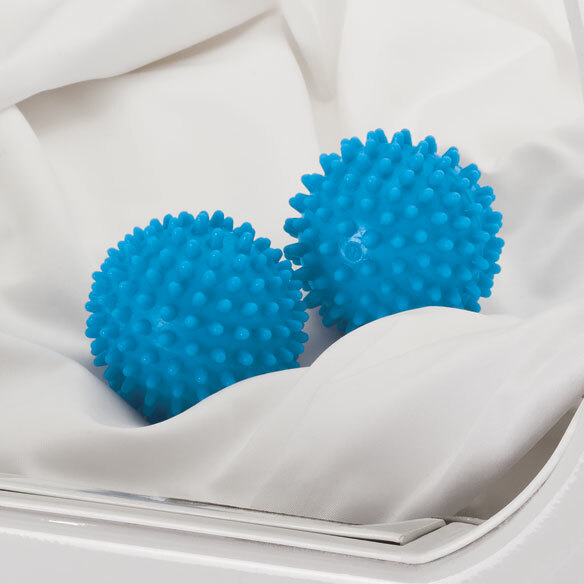 Place reusable dryer balls in your dryer with wet clothes to fluff, reduce static and cut drying time. Non-toxic, hypoallergenic fabric softener balls are economical and chemical-free. Set of 2; each approx. 2 1/2” dia. PVC. SHEETS TWISTED AND STILL PARTIALLY WET? I thought the dryer balls were a hoax but, after getting fed up with my sheets coming out of the dryer twisted and still partially wet I decided to take a chance. Well I used them and THEY WORK! This was my second order of dryer balls as I somehow lost one and I liked the job they did well enough to order a replacement. I now have three dryer balls but, I don't mind because, my sheets don't come out all twisted and wet from the dryer. I'm a happy washer! I have had these before and loved them. Unfortunately they were lost. Am very glad to have found them again! They cut the drying time and help with fluffing and removing wrinkles as well. Works as advertised and I would recommend it to my friends! I'd rather use the balls instead of smelly dryer sheets. I am very happy with this my clothes came out very soft. My neighbor asked about these so I was happy you had them in stock. These dryer balls work great! These dryer balls work great . They cut some of the drying time in the dryer! Just what I had been looking for and the price was great. Does the job and are cost effective. 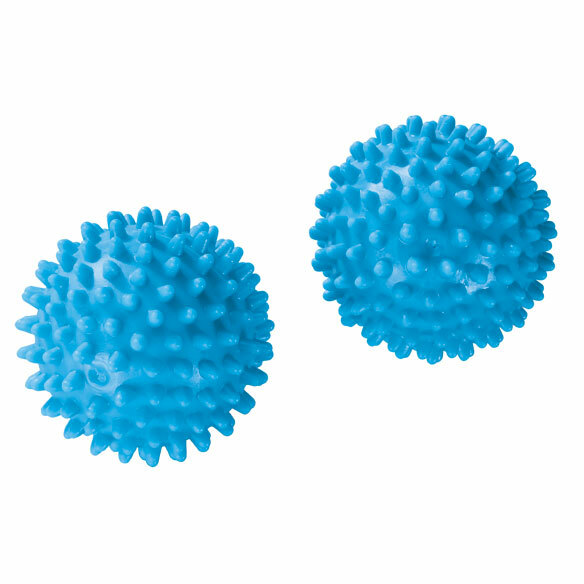 Recently purchased these dryer balls to replace the pair I purchased about 20 years ago, and have used ever since. (One split open just recently- after 20 years use!- thus the purchase of a new set.) They've always done a great job of preventing static cling, saved me money -did not have to buy dryer sheets that are not long lasting. Also- had a sensitivity to the perfumes used in the dryer sheets, so the dryer balls are a plus for the environment. Just throw the dryer balls in with your wet laundry. They are easy to use and work well. We had to replace a set that we had for many years. It wore out. They do save me on drying time! I use these dryer bowls for my towels and cotton clothes all the time. So easy to use, just add to the dryer. My towels dry faster and fluffier. And my cotton clothes seem to be less wrinkled! The product is great and I love using it in the dryer to make my clothes dry better. We got a couple sets of these to see if they'd help with softeness of our clothes while drying. They do pretty good. We don't even need fabric softener anymore. getting more SOON. Well the dog ate one so I only used one and it did ok. I thought it would get tangled up in a sheet and just hang there. However when I opened the dryer door, there it was up front and free, waiting for me to remove it then pull out the laundry which was soft enough for my liking. And I think softer then using nothing at all, which I do often. Ill get another set and keep one for a spare, if the dog gets ahold of it again. Works good for all kinds of clothes in dryer minus fabric softner. I have my caregiver use these in the dryer with my towels or sheets and they seem to work fine. I was delighted when I first got a pair of these dryer balls. After a few years of constant use, they separated, and I had four half-balls which seemed to work just as well. The only problem with these balls is the racket they make bouncing against the wall of the dryer. My daughter finally sent me a package of woolen balls (I think made by winding wool yarn into a 3" ball, then felting the outside). These work as well as the plastic ones, and are whisper-quiet. I would recommend them over the plastic balls for those who can afford them. Keep them in the dryer to fluff all the laundry. Works best on bath towels, but also removes wrinkles from cottons. But they are a little noisy when using with small loads. If you don't care about softness, this product works to eliminate static and lint. Just throw into drier with wet clothes and decrease drying time. Balls help separate clothes as they tumble or spin to decease drying time. One of the balls I bought split in half after the first load. I bought a set about three months ago and one of the balls has already completely disintegrated. It looks like a pitbull used it as it chew toy. The other ball is still in good shape, so go figure. the stuff they are made of is too lightweight to bounce around in the dryer. not happy with them. These are just hard plastic balls. They did nothing in the dryer. Clothes came out with static. Was the worst purchase i have made. I already ordered these and I love them. My clothes seem to get dry quicker and have less static. I also save money on not buying fabric softener sheets. I've had them before. I needed some more. And they really do work. my mom has these and loves them so I want to try them. live in apartment building and need to share dryers,so hoping will help dry loads faster. Have ordered them previously and they make dryer items softer. Just thought I would give these a try to see if I can avoid some of the wrinkles. I have a Border Collie, his hair is long & fine. It's always still in the dryer, as is otherwise lint. This is the perfect solution. Loved the last set of dryer balls. I previously had a set of these and they are wonderful. I'm always looking for products that are less harmful to the environment. Just wanted to try them. I had a need and this is a good value. a friend has these and they are fabulous.